LEGO Derby is a new, cool way to race cars! Build a car made from Official LEGO parts and race it down a pinewood derby track. You get all the fun of pinewood derby racing without the extensive time it takes to make a car from wood. Just snap together LEGO parts, right? There are a few problems to solve. Commercial LEGO wheels and axles do not work on a pinewood derby track. You need the perfect wheel spacing so your car fits the lanes on a pinewood derby track. You need the correct track clearance. You want your LEGO Race Car to be fast! LEGO parts are not made for racing like pinewood derby car parts, so a car built with LEGO parts will be slow. The plastic LEGO axles are slow. The rubber LEGO wheels are slow. Lastly, if you've raced pinewood derby cars, you know that you need to add weight to your car to reach maximum velocity. So, how do you add weight to a car built with LEGO parts? How do you make a LEGO car that is fast like a pinewood derby car? 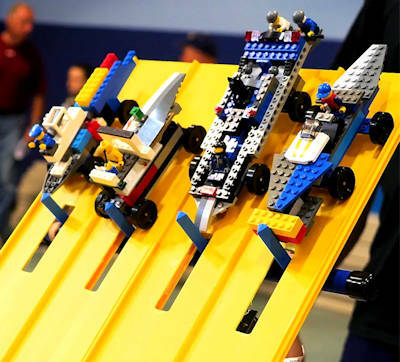 How can you build a LEGO race car that fits on a pinewood derby track? 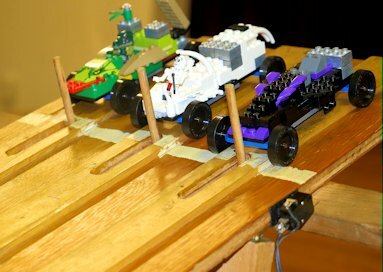 ...all of these feartures were designed for speed so your LEGO race car is as fast as a pinewood derby car. 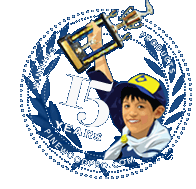 Pinewood Pro used their engineering skills and 15+ years of pinewood derby racing expertise to design the perfect parts to bring the fun of pinewood derby car racing to LEGO Derby car racing! The PRO Brick is a custom designed part that supports a Speed Axle and custom Ultra-Lite Wheel designed for speed. The PRO Brick, Speed Axle and Ultra-Lite Wheel are pre-assembled to give the perfect pinewood derby track clearance and the Wheel is preset with the perfect gap to minimize wobble and friction. Each PRO Wheel Assembly weighs only .11oz (3.15g) so your car starts fast, accelerates fast and allows you to place more weight on the car body giving your car more inertia through to the finish line. Individual wheel assemblies gives more flexibility to move wheels. More flexibility means more creativity. Just snap the PRO Brick Wheel Assembly into any LEGO part and you're off to the races. 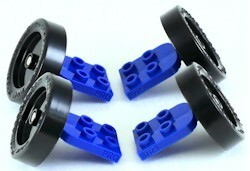 We designed these parts for speed so your your LEGO Derby Car will be fast. A fast car needs fast wheels and fast axles . The PRO Derby Wheel is Ultra Light, yet sturdy. The axles are nickle-plated comparable to our best pinewood derby speed axle. This new Wheel-Axle combination will make your LEGO Derby Car zoom down the track comparable to the fastest pinewood derby cars. Lastly, you need weight, since your car flys down the track from the force of gravity. Just like pinewood derby cars, you want your LEGO Derby Car to have the maxiumum weight allowed in your race rules so your car has the inertia to speed to the finish line. The easiest way to add weight to your car is with our new Derby Zinc Brick. Just snap this zinc weight anywhere on your car just like any other LEGO part. Each brick weighs .44oz. You can easily move this weight to adjust the center of gravity for optimal performance. For more speed tips, the Winning Pinewoood Derby Secrets also applies to LEGO Derby Car racing. 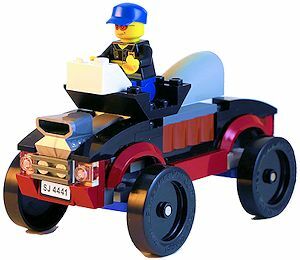 If you want to build a LEGO Pinewood Derby Car, you need to build your car on top of the "pine wood" derby wooden block that comes with your official pinewood derby kit. In addition, you need to use the axles and wheels that come with your official kit. All pinewood derby races require using the parts that come with your car kit. 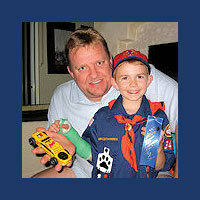 Your kit could be the BSA kit for Cub Scouts or the Awana Grand Prix car kit or other similar pinewood derby kit. Read our free Guide How to Build a LEGO Pinewood Derby Car in 6 Steps that tells you how to build an official pinewood derby car base and adding LEGO parts. 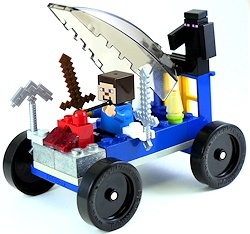 Running a LEGO Derby race for your Pack, Summer Camp, School or Church? LEGO car racing is great idea for Cub Scout Recruitement night. 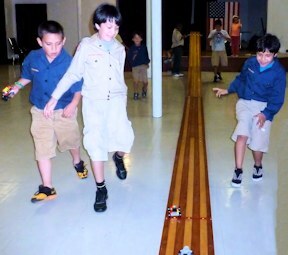 It's fast, it's fun and kids get a feel for the excitement of a fun scouting event building and racing cars. Best of all, adults and siblings can build and race cars too. 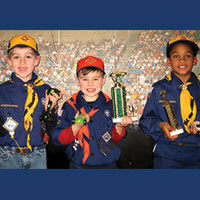 Check out images from our Pack 44 LEGO Car Racing for Cub Scout recruitment. Run a LEGO derby car race to teach Engineering and the Physics of motion for a STEM summer camp. I taught AND demonstrated the principles of Friction, Inertia, Center of Gravity and Velocity in a fun way. Check out images from our STEM Summer Camp LEGO Car Racing. 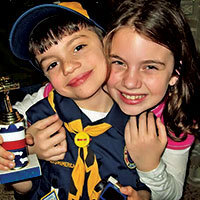 Call Pinewood Pro 203-400-3713 to discuss building and racing cars built with LEGO parts, race awards and race rules. LEGO is a trademark of the LEGO Group, which does not authorize, sponsor or endorse this site in any way. We are proud to be the inventors of the PRO Brick Wheel Assembly (patent pending) and Zinc Brick. These parts are the best solution for racing LEGO derby cars down a pinewood derby track because we incorporate over 15 years of car racing into these parts so your LEGO car will be the fastest. After market wheels are heavy and therefor slow. As engineers, we think our unique, track tested PRO Brick, ultra-lite wheels and nickel plated axles are the best LEGO derby solution. Pinewood Pro has helped racers for over 15 years. But don't take OUR word for it...read what our customers say about Pinewood Pro.